KVEW TV News Broadcast, June 20, 2008, featuring SPLAT and Alla Zelenjuk. "The captain has turned off the seatbelt sign, and you are free to explore the mysteries of the universe." Science fiction? Not for the 80-person team of U.S. and Canadian scientists flying over the North Slope of Alaska in an intensive month-long field study in April. The group's mission: to measure, with great precision and detail, key elements of the atmosphere to help reveal how the Earth's climate is changing. The Arctic region is an ideal study location because it displays dramatic evidence of global changes such as melting sea ice. Scientists from the Pacific Northwest National Laboratory are participating in the leadership and instrument teams for the field campaign, which is funded by the U.S. Department of Energy's Atmospheric Radiation Measurement Program with contributions by the Atmospheric Science Program, Environment Canada, and the National Research Council of Canada. To obtain direct measurements, researchers packed more than 40 specialized instruments into a Canadian National Research Council Convair 580 aircraft. One instrument, fondly nicknamed SPLAT II, is generating considerable excitement in its maiden voyage. SPLAT II is a second-generation Single Particle Laser Ablation Time-of-Flight mass spectrometer. At 900 pounds and roughly the size of a small compact car, it's by far the largest instrument on the plane. This unique, ultra-sensitive, high-precision instrument allows users to measure the fundamental chemical and physical properties of individual particles at the nano- and micro-scales. It's the first-ever field-deployable instrument that provides, in real time, the size, density, shape, fractal dimension, and composition of individual particles down to 50 nanometers in diameter, or 160,000 times smaller than the width of a human hair. In fact, SPLAT II is the most precise and sensitive instrument of its kind in the world. PNNL's Dr. Alla Zelenyuk designed, constructed, and has operated SPLAT II since 2006 at the Environmental Molecular Sciences Laboratory, a DOE national scientific user facility located at PNNL, to investigate climate, air pollution, human health, bioterrorism, and nanotechnologies. DOE's Basic Energy Science Program and EMSL funded the instrument's initial development. To get SPLAT II flight-ready, Dr. Zelenyuk spent six months redesigning it. With funding from DOE's Atmospheric Science Program, PNNL scientists, engineers, and machinists reduced the instrument's weight, footprint, and power consumption and gave it a new shock-absorbing frame, while maintaining its high-performing capabilities. In the Alaskan field campaign, researchers are using SPLAT and other instruments to directly measure the amounts and properties of tiny particles in the air, called aerosols. In the Arctic, ice crystals can deposit on aerosol particles to form ice clouds. This relationship between aerosol particles and clouds plays a major role in the amount of precipitation and heat that reach the Earth's surface. Scientists simulate Arctic cloud processes using computer models, but many mysteries remain about how aerosols and clouds really behave. By obtaining more real-life measurements, scientists can fine-tune the models to more accurately predict climate change and its impacts. 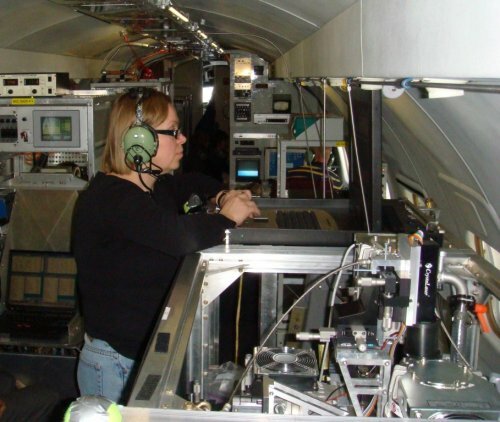 During flights, tiny particles that are invisible to the eye get sucked into SPLAT's inlet, where they are analyzed for size, composition, and other characteristics. The instrument can detect and measure up to 100 particles per second, for a total of more than 1 million particles during the month-long mission. This meticulous work is yielding discoveries at unprecedented levels of detail. Early results show that certain kinds of airborne dust and metal particles have a tendency to attract ice crystals around them, forming clouds. Scientists also are seeing particles from worldwide biomass burning and other chemicals and organic materials. SPLAT gets no rest. After returning to EMSL at the end of the campaign, it will travel again—to the University of California Irvine to study aerosols and to the University of Wisconsin for research on vehicle emissions. In the meantime, PNNL researchers will be uncovering new insights about climate change from data captured in the Alaskan skies. Acknowledgments: Pacific Northwest National Laboratory staff involved in the field campaign include Dr. Dan Cziczo, Dr. Connor Flynn, Dr. Steve Ghan, John Hubbe, Dr. Alex Laskin, Lynne Roeder, Debbie Ronfeld, Dr. Beat Schmid, Jason Tomlinson, and Dr. Alla Zelenyuk.